Overriding question: What took y’all so long? Bravo made the first two hours available for review. And they don’t disappoint if you’re into the series’ trademark blends of hard-partying, drinking at all hours, over-giggling, giddy shopping, gaudy charity galas, marital unrest and choreographed cattiness. Have I missed anything? 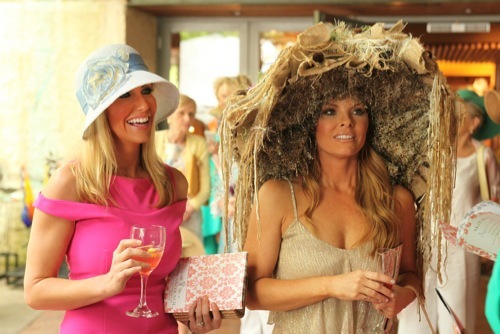 In the first episode, Stephanie spends ample time pounding down “Jesus juice” (white wine) in daytime hours while over-cackling with her best friend, Brandi Redmond, a former Dallas Cowboys cheerleader whose husband, Bryan, is determined to be a millionaire by the age of 40. In what may be the signature quote of the series, Brandi tells the camera, “We’ll have a little bit too much to drink and we’ll pee in bushes and she (Stephanie) will fart on command and I will dance in her fart.” Mamas, don’t let your babies grow up to be Bravo housewives. LeeAnne Locken, a self-described “carny girl,” has never been married but yearns to tie the knot with police officer Rich, with whom she’s been living for six years. She’s otherwise deeply devoted -- some might say addicted -- to charity functions. As a longstanding volunteer, it allows her to mingle with the city’s rich movers and shakers. “I get to live a life that most people dream of,” says LeeAnne. LeeAnne’s best pal is Tiffany Hendra, a former Los Angeles model and TV host who’s returned to her home state with husband Aaron, an Australian with ambitions to be a big-time recording artist. Although it’s tough to pick any real winners here, Tiffany may be the most sympathetic of the lot. But that of course could change very quickly, depending on what the scriptwriters, er, people following their real-life adventures -- might have in mind. At the other end of the teeter totter, the wicked witch is Brandi, who does a mean-spirited impression of LeeAnne while giving vacuous a bad name. 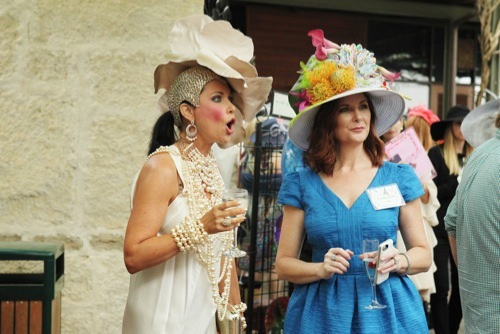 LeeAnne Locken (left) is quite good at looking aghast. This girl’s thing for poop is somethin’ else. Earlier in the same episode, her two little daughters help to make a chocolate cake for their grandma’s birthday. “It looks like poop pie,” says Brandi. Brandi and Stephanie later conspire to put one of the bigger fake turds on LeeAnne’s lunch chair. It doesn’t appear that she sat on it, but Stephanie is thoroughly unrepentant. “She (Brandi) brought humor to something that could be boring,” Stephanie reasons. “ So they can all go f*$k themselves.” Pause, one-two. “I shouldn’t have said that” -- with a snort for punctuation. LeeAnne has vowed to attack when attacked, though. So let’s not worry unduly about her because the claws are gonna come out and Brandi’s also gonna get scratched in due time. The saving graces of all this are supposed to be the charities benefiting from the money given by the some of the housewives’ menfolk while the housewives themselves put on a show. “I can fart on command,” Stephanie boasts. Still, she’s not completely fulfilled as a mother of two sons with a husband who always seems to be away on business and leaves her with chores to do. These are usually more or less accomplished with Brandi and wine in the mix, whether it’s haplessly trying to install a garage door opener or successfully destroying a little wasp’s nest. “I feel like Travis’s dream woman would be Betty Draper (of Mad Men),” laments Stephanie, who’s ready for “The Rapture” to take her away from it all. “I’m so OK with that.” Easy now. So what does this say about Dallas and these women? Nothing, really. Any city on the receiving end of the Housewives franchise can expect to be painted with a very broad, soap operatic brush. It’s all in the editing, and Brandi, Stephanie, LeeAnne, Tiffany and Cary may not be entirely pleased with the way they’re portrayed in these opening episodes. They’re getting paid, though. And the price of admission often requires playing the fool. In that context, Real Housewives of Dallas delivers the goods, the gossip and the usual windfall of ridiculously over-sized moments. “Everyone knows Lee Anne Locken. She’s like the mayor of Dallas,” Tiffany claims in Monday night’s early minutes. “They call me the Mouth of the South, and I’m OK with that,” LeeAnne adds. That’s over-stated in both cases. But all of this is critic-proof, and everyone is free to watch what they choose. Meanwhile, let me clean the brain pan drippings off my keyboard. And then I’m gonna go pee in the bushes.